There is a lot of commentary out there about Penn State and Joe Paterno. I don’t have much to add, but with today’s announcement that Penn State has taken down the Joe Paterno statue, I thought some comments were necessary. Obviously, Sandusky can rot in whatever very special level of hell is reserved for him. I do not think there is any controversy about that. 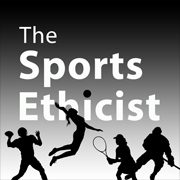 Moreover, that part of the story is not about sports, so, qua Sports Ethicist, there is nothing more to say. There is enough evidence now to show that leading Penn State authorities acted improperly and immorally (if not illegally in some cases). Many are calling for the so-called Death Penalty (where the NCAA shuts down the program completely for at least a year if not more). Others, Yahoo Sports, say that the NCAA is more likely to cut scholarships and bowl eligibility. Both punishments end up hurting a lot of innocent people (current students and athletes, supporting businesses) who had nothing to do with the abuse or the cover up. Nevertheless, the problems at Penn State, according to the Freeh report, are deep and led to tragic consequences. The Death Penalty seems overly harsh to me, especially since all the principals are dead, out of a job, or facing criminal charges. I guess we will see a multi-year loss of bowl eligibility and severe cuts to athletic scholarships. Nevertheless, Paterno is not off the hook by any stretch. At best, this happened on his watch and under his nose. But more than that, even if not privy to what Curley and Schultz knew, he chose not to look. He closed his eyes and let others handle it. “… his basic vice, the source of all his evils, is that nameless act which all of you practice, but struggle never to admit: the act of blanking out, the willful suspension of one’s consciousness, the refusal to think—not blindness, but the refusal to see; not ignorance, but the refusal to know. It is the act of unfocusing your mind and inducing an inner fog to escape the responsibility of judgment…” (Rand, Atlas Shrugged). Rand’s description of the moral vice of evasion seems to fit Paterno’s response perfectly. What I’ve seen of his grand jury testimony and public comments indicate to me that he didn’t want to know about any of this, he didn’t want to deal with any of it. After McQueary’s report, Paterno passed the information on to others, hoping they would take care of it. Paterno seemingly closed his mind, hoping that it would all go away and he wouldn’t have to deal with it. He was in a position to know and in a position to know that there was something to know (and then certainly in a position to do something about it). Paterno’s willful blindness and blanking out, where he could have reasonably discovered the truth and acted on it, made possible the evil that Sandusky did. For that, Paterno is morally blameworthy. For that, it is right that the statute come down. For that, it is right that Paterno’s legacy will forever be damaged and marked by the abuse he could have and should have prevented. The NCAA announced its sanctions of Penn State this morning. Penn State was handed a $60 million fine, a four-year football postseason ban, a five-year probation period, a stiff reduction of scholarships, and the vacation of all wins (112 including bowl wins and championships) from 1998 through 2011. (ESPN story) These are severe penalties. I was surprised by the win vacation and the size of the fine, though it all seems about right to me. The punishment seems to balance the need for punitive measures while taking into account the current players and students. They will get to play regular season football and students will get to see games. Ancillary businesses will not be as badly harmed as under total suspension. Players will also be able to transfer without loss of eligibility (though it is most likely too late for this fall). It sends a strong and loud signal that institutions need to be more responsible. In terms of the future of Penn State football, this is probably much worse than the Death Penalty for one or even two years. I doubt Penn State will ever recover as a major national football program. Maybe that is as it should be. I unequivocally agree with every word you wrote and the manner in which you wrote it. Thank you. Excellent commentary. I see both sides of the argument as to whether the death penalty is an appropriate reaction by the NCAA. On one side, it does seem unfair that such a ruling would punish students, athletes, and local businesses not involved with the horrific events that took place at Penn State. Furthermore, the football program has such a rich history and loyal following that I don’t believe simply shutting it down for a couple years would be all that effective. On the other side, it is clear that the administration at PSU was unable to exercise any sort of institutional control over the football program. In fact, Graham Spanier and other officials allowed Joe Paterno to dictate how they would react to finding out what Sandusky was doing in on-campus facilities. Additionally, the “football is religion” cult-like way of thinking is so pervasive, both on and off campus, that anything short of the death penalty will do llittle to alter this unhealthy mindset. And finally, I don’t believe the NCAA should at all be concerned with whether their decisions have collateral effects on non-collegiate sports-related entities. Its main concerns should be focused on whether member institutions and conferences are upholding the core ideology and values of the organization. In this instance, there seems to be gross violations of the NCAA’s mission. In the end, I would support either consequence. The NCAA has treated the athletes in question as they have always treated the athletes under their charge: as uncompensated serfs. Whatever magnanimity the NCAA shows them is just that: the patronizing sufferance that a master grants his slave. Coaches and administrators are free to make millions, to pursue more lucrative contractors at any time, to negotiate the terms of their contracts and–perhaps most important–they are free to transfer at any time to any place. The athletes, by contrast, have little to no negotiating ability, make no wages and are severely punished if they are found to be so much as _bartering_. If they transfer without the NCAA’s dispensation, they forfeit a year of eligibility. Penn State exemplifies the absolute worst of shamateur athletics: a system designed to engorge middle-aged men at the expense of penny-less youth. The NCAA stands astride it’s moral cavern and declaims itself master of time itself. Wins become losses, trophy’s turn to ash, and the hopes and dreams of millions of teenagers are fodder for the grinding wheels of million dollar endorsement deals and media contracts. It is reprehensible what happened at Penn State, but NCAA sanctions are fatuous preening.